Thanks for the questions. I’ll check on the Audible discount with my publisher and get back to you. I’ll also let my publisher know about the illegal posting on YouTube.com. Thanks again for the info. 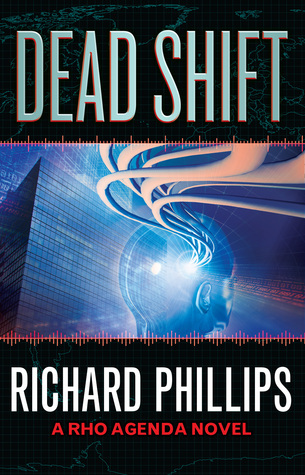 Hi Richard, I just finished Dead Shift and thoroughly enjoyed this story and series. The original RHO trilogy served as a re-introduction to reading for pleasure for me, and I was extremely happy to see that you had continued your work in this series. As I read through this prequel series there was one plot “bridge” I was very much hoping you would provide, but at the same time I knew it was a long shot. I kept thinking to the chapter in Wormhole where Jack encounters Eduardo and thought it would have been awesome to read this scene from the perspective of Anchanchu. As Eduardo attempted to enter the mind of the Ripper and stumbled into more than he bargained for. I just wanted to say thank you for your effort in these novels, they have been great fun to read, and I recommend them to all of my friends. One last suggestion, as I read through the Jack Gregory trilogy, I kept trying to remember characters from the Rho Agenda and it would have been helpful to have a character appendix to quickly remember the important details from the other books. Just a thought. Thanks Marcus. Excellent suggestion and I plan on providing such a character list in my next three novels since all of the old characters (that still survive) will be back for The Rho Assimilation. I also plan on tying up a bunch of loose threads from the previous six novels in these three books (i.e. the stymied Kasari invasion, what happened to Jennifer and Raul, Jack and Anchanchu/Khal Teth, the Incan Sun Staff, the missing holographic data sphere that was in Admiral Riles’s possession, and the story of Jack’s and Janet’s son, Robby). I’m hoping to have the Beta Reader draft of Book One out to my Beta Readers by the end of August. Thanks again. Don’t tie up too many loose ends! We need more. I hate it whenever a book’s universe inevitably comes to an end. It feels like I’m losing a bunch of friends forever. Never fear, it’s almost impossible to resolve everything with finality.